You can invest in a Roth IRA if you can show proof of earned income as we described in the previous section. A job for which you receive a W-2 form for your taxes is proof that you have earned income. If you don’t have a regular job but you get money for providing services to your parents at home or you even have your own business, some financial experts say that you can invest in a Roth IRA if you keep good records of how you have earned that income. Assuming you qualify to invest in a Roth IRA, the following sections summarize some of the considerations in opening an account. When you invest in a Roth IRA, you are actually opening an account to deposit money to purchase investments. If you want very conservative investments, you probably need look no further than your local bank or credit union for a place to open a Roth IRA to purchase Certificates of Deposits and Money Market investments. You can establish these types of IRAs with as little as $200 or less. If all you want are the mutual funds of one mutual fund company such as Vanguard in your Roth IRA, you can go directly to that company to establish a Roth IRA with them. In this case, the funds that you deposit in your Roth IRA would be used to purchase mutual fund shares of the company. You can also just as easily establish a Roth IRA with a mutual fund company that has a wide variety of funds. If you are interested in purchasing mutual funds, doing so through an IRA is a good idea because you will find that the minimum balance requirements are often much lower than for investing in regular mutual fund accounts. For example, the investment minimum for a regular Vanguard 500 Index mutual fund is $3,000 but for an IRA, it is $1,000. 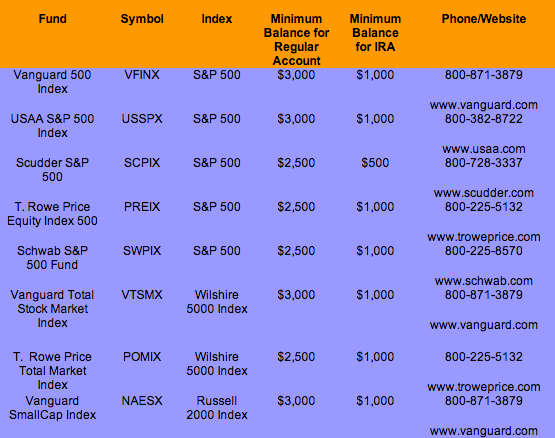 The table below shows investment limits for IRAs in some popular no-load mutual funds. If you want to include a combination of stocks and mutual funds in an IRA, you would go to your online discount broker to see if they offer such retirement accounts and offer the varieties of mutual funds and stocks you would want to select for them. Of course, when you choose individual securities to put into your IRA, you pay a commission on each trade. As a start, you can check our list of affordable brokers. If you remember from an earlier section, Direct Purchase Plans allow you to buy shares of stock directly from the company. Look into companies that offer Roth IRA Direct Investment Plans. Exxon Mobil, for example, has a Roth IRA Direct Investment Plan.